1. Combine the flour and baking powder in a large bowl. Mix in sugar and salt. 2. Pour in the milk and water. Combine with a balloon whisk. Add the eggs. Don’t over stir, just combine all ingredients. Rest for 10 minutes. 3. Turn on the electric pancake pan according to the manufacturers instructions. Brush a bit of oil on the pan. Pour in about one tablespoon of batter into each hole. When bubbles appear, bottoms turn lightly brown, use a skewer or spoon to flip over and cook the other side. They should be cooked until both sides are golden brown. 4. Transfer onto a serving plate, served with maple syrup or honey, sprinkle icing sugar on top. Note: The batter should be runny or else the fried pancakes won’t be soft otherwise. Add water if the batter is too thick. You might like to add some fillings between two pieces of pancakes, like jam or fruits. Thank you to Christines Recipes for this recipe. Nice recipe ! 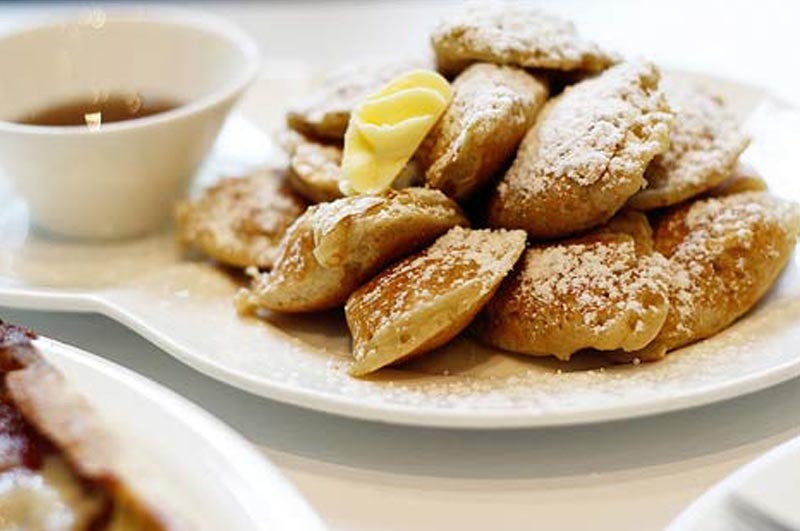 In dutch we call them ‘Poffertjes’ – a very traditional dutch winter snack!